Adventures In Uglyworld: Uglyworld #1297 - Does You Thinks I Can Dunks? 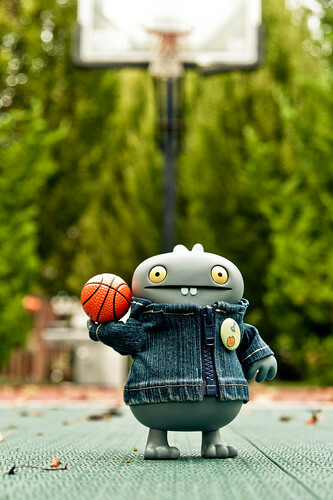 Uglyworld #1297 - Does You Thinks I Can Dunks?, a photo by www.bazpics.com on Flickr. Once Baz arrivereds home from workies, he findereds my noter that I was overs at the basketballer court havings fun and came overs to checks out my skillers! After we playereds some one on ones againsts each other Baz gavereds me a challenger, "Babo, if you can dunk that ball in the net without using a ladder or steps of any kind, i.e. just by jumping, a big pile of cookies will be yours, but if you can't make it you're doing my washing for the rest of the month! ".